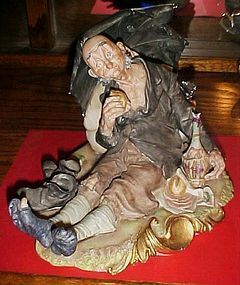 Wonderful large Capodimonte figurine of a hobo sitting uder his umbrella having his lunch and resting his tired feet. I believe this is a Bruno Merli piece, The Bruno is not very legible but is in the typical impressed "block" on the umbrella edge. He measures about 6 3/4" tall and is 9" long. Hand painted bisque porcelain. Absolutely perfect condition and very detailed and life like. Has the blue Crossed arrows and S 8390 on the bottom.